Biological Quality Group staff in the non-steriles testing laboratory routinely test multiple samples of products for microbial limits. To reach the product in the bottle they need to remove the machine crimped cap from each container using hand held steel pincers which grip and manually prise loose the bottle cap. This process was causing great discomfort to the operators involved as the hand and wrist action used to remove each cap placed pressure at the thumb base resulting in cramping and pain. This discomfort continued after long periods of rest. Initially a smaller, lighter pair of pincers was purchased but these had little success at alleviating the discomfort and it was concluded that the pain must originate from the hand extension needed to open and close the instrument. 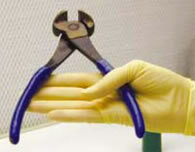 This led to modifying the pincers by removing a half circle from each pincer edge to limit the hand extension required. 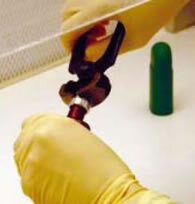 The modification enables staff to remove the bottle caps with a minimum of effort and a much reduced stretching action. Once the newly modified pincers had been implemented, each operator noticed a significant improvement in handling conditions. Pain was eliminated and any discomfort felt was only after long periods of testing which can be avoided by operator rotation.